“Mind-blowing” is how lecturers have described their experiences teaching horsemanship at the APY lands of north-west South Australia. Charles Darwin University (CDU) lecturers Peter Dempster and Toby Gorringe have just returned to the Northern Territory after completing the highly successful program that culminated with a ceremony and symbolic cattle muster. The program is aiding the revival of pastoral skills in a region in dire need of local talent and a community wanting to re-engage with the local economy. CDU has delivered the training to 30 local men in co-operation with TAFE SA and with backing from multiple government departments, local industry and the APY Land Management Unit. Anangu Pitjantjatjara Yankunytjatjara is the collective name for all the people (Anangu) for the Pitjantjatjara and Yankunytjatjara Lands and who live on freehold title of about 103,000 sq km of north-west South Australia. Fully operational yards and animal handling facilities at Double Tank were used for the three-week intensive project that saw local men break-in and ride horses. 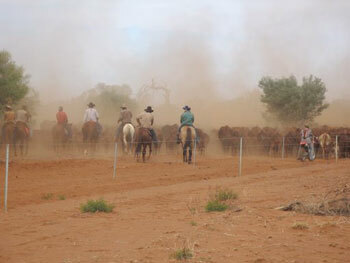 And after a celebration and awards ceremony, they proved their capability and motivation with a day-long cattle muster. Strong accountability, governance and support were key attributes of the programs with senior Anungu (Tjilpis) actively participating in training and supervision of younger men (Watis). And the students have bright work prospects with 30,000 cattle on the lands and 10 new pastoral businesses approved for development by the APY land management unit. These businesses are recognised legal entities fully accountable for management of the resources. This is a significant development as the previous business arrangements had minimal accountability to the landholder. The training in horse breaking starts a capacity-building program developed during 2008 with TAFE SA and CDU working to expand vocational training options for the Anangu peoples. The horse-breaking program taught units from CDU’s Certificate II in Rural Operations covering literacy, numeracy, safety and team work. Mataranka (Katherine) based lecturer Toby Gorringe and Alice Springs-based lecturer Peter Dempster said they gained immense personal satisfaction from the project. “I’ve seen huge changes in the men since they’ve got pride in themselves and confidence in what they are doing and it makes my job such a pleasure when I see responses like this,” Toby said. Peter Dempster agreed. “The gratitude expressed to both of us and unashamed pride of the attendees and extended families at the closing ceremony was mind-blowing and we have never experienced such open, heartfelt appreciation of our work,” he said. TAFE SA’s Manager of the APY Lands Janet Skewes said the value of responding to and working closely with APY Land Management Unit ensured a successful program. “The opportunity to build on the program with further training in the future now exists,” she said. Alice Springs-based CDU Director of remote co-ordination, Paul Fitzsimons said he was positive of further work in the APY lands. “Both TAFE SA and CDU share a common desire for more positive educational strategies in the bush and we look forward to working together in future projects,” he said.